The black keys on the piano are known as the flat and sharp keys. In technical terms this means they make a note half a step (or a semitone) lower and higher respectively in pitch from their corresponding white key. You will notice that the black notes are grouped in twos and threes, and taking the time to remember which is which is also a useful way to remember the white keys’ names. Each black key acts as both a sharp and a flat. A sharp is a note that’s half a step higher than the corresponding white key, and the flats are half a step lower. Tones and semitones (or steps and half steps) are common terms to define distance between notes. A semitone is the distance between each key on the keyboard. Each sharp or flat will be a semitone away from its corresponding white key. The distance between E & F and B & C is also a semitone as there are no black keys between them. First, let’s focus on moving to the right from Middle C. The black key immediately to the right is C sharp (C#). This is half a step up from C. Take another half step and you’ll be at D. Working in order from Middle C to the right the sharps are C#, D#, F#, G# and A#. B# and E# are C and F respectively, although they are rarely referred to in the former manner. Always remember that sharps are to the right of a note. Now find Middle C again and this time go left. The first black key is B flat (Bb). Working down in order from Middle C the flats are Bb, Ab, Gb, Eb and Db. Cb and Fb are B and E respectively, although again they are not usually denoted this way. Flats are always to the left of a note. Take some time learning what the names of the black keys are and see if you can recognise the difference in pitch with their corresponding white key. Step 1: The first thing to get right is your technique. You don’t really want to use your thumb on the black keys. Instead, try to only use your middle three fingers. This makes it easier to transition between white and black. There will be times when this is unavoidable, but until this is the case, try to keep your thumb away. Step 2: When playing the black keys you might need to tuck your thumb under your fingers to hit a white key. Try this now - play Middle C with your right index finger, C# with your middle finger and then D with your thumb. Later on, you will find this technique useful when performing scales. Step 3: Let’s try the same technique with the left hand. Place your left thumb on Middle C. Now play B with your index finger, Bb with your middle finger and then A with your thumb. Practise until it feels natural. 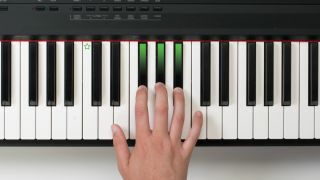 Now your thumb is on A, it frees up the rest of your fingers to play lower notes, both black and white. Step 4: Let’s attempt a scale. Starting with your index finger on your right hand and, working from C to F, see if you can play the white and black keys in a fluid motion. Use your thumb for D, and end with your fourth finger on F. Once you’ve mastered that, go back down again using the same fingers. Black keys to the left of white keys are flats. From C (starred above) down an octave these are Bb, Ab, Gb, Eb and Db. Any black key to the right of a white key is a sharp. From Middle C up an octave these are C#, D#, F#, G# and A#. If you need help, remember the three white keys around the two black keys are C, D and E, while the other four are F, G, A and B.